New York City • Los Angeles, CA • South Beach, Miami, FL • Australia • Florence, Italy For additional information regarding New York Film Academy program outcomes and gainful employment disclosures, please visit: nyfa.edu/ged. or 41 years and counting, Artexpo New York has changed how people buy and sell art. This year, we underwent our own evolution as the show moved to Pier 90—and I couldn’t be more excited to finally welcome you here as we champion the transformative power of art. As you walk through aisle after aisle of innovative artwork—from paintings and prints to sculpture and photography—prepare to be captivated, delighted, surprised, maybe even shocked. Art is powerful. It challenges the status quo, changes our perceptions, and pushes us to see ourselves and others from a new perspective. Through its power, art transforms. 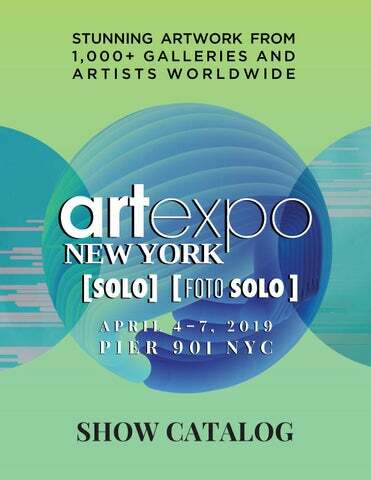 Over the next four days, Artexpo New York will showcase over 250 exhibitors featuring hundreds of artists and their work. Don’t pass up the opportunity to step into the booths and talk to the artist or dealer. With live demonstrations happening throughout the show, you might even get the chance to watch as they work on their next masterpiece. Whether you’re shopping for a client, looking for the perfect piece for that special spot at home, or on the hunt for a gift, you’ll have access to thousands of artworks. When you’re not scouting for that hidden gem, stop by the Pier 90 Lounge to mix and mingle with collectors, gallery owners, architects, designers, and art dealers or listen and learn at our Topics & Trends education seminars, which offer expert perspectives on today’s most pressing industry challenges and the trends changing the way business is done. I’d like to give a special thanks to you, our fabulous attendees, for making this show a success year after year! We couldn’t do it without you. So go enjoy the show! It’s going to be an extraordinary weekend of fine art, design, originality, and the latest trends in the art world. Join us for a complimentary wine tasting. try americaâ&#x20AC;&#x2122;s #1 french wine! With a career that spans 30 years, Linda Mariano is a leader in marketing, brand management, e-commerce, and promotion initiatives for major retailers, specialty retail, art industry, licensing partnerships, media, and entertainment, as well as entrepreneurial business environments. Her expertise and strong track record of exceeding marketing and sales goals, building brands, and driving business success make her a vital part of any organization. She has created programs that added multimillion-dollar sales via directing strategic alliances and partnerships with Disney, Warner Bros., Elvis Presley Enterprises, NASCAR, Major League Baseball, and others. 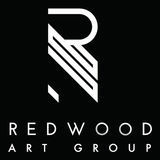 For Redwood Media Group, Mariano oversees the marketing and brand extension efforts of the company. Meagan J. Meehan is a published author, poet, cartoonist, and produced playwright. In addition to writing for Artblend, Meehan writes columns for the Great South Bay Magazine, Blasting News, and Entertainment Vine. She is also a stop-motion animator and an award-winning abstract artist. Meehan holds a BA in English literature and an MA in communication. She is also a passionate animal advocate and a fledgling toy and game designer. Meehan’s artwork aims to play with people’s perceptions and enable them to enter a world where there is no right or wrong—defining a new art movement called Conscious Perceptionalism. Michael Joseph is best known for his internationally award-winning black-and-white photographs. He has traveled to all 48 contiguous states in the U.S., as well as many international cities. His work has appeared in numerous exhibitions and has been honored in many juried art shows. He was named one of the world’s top 10 photographers by the 2012 Sony World Photography Organization. Joseph’s photographs are held in several important private, public, and museum collections. His work is licensed to major retail outlets and can be seen in many motion pictures, television programs, and commercials. Joseph is the vice president of Artblend, a full-service art company located in Fort Lauderdale that consists of a fine art gallery, magazine and book publishing, art fair partnerships, and a marketing division. 4 p.m. MEET THE ARTIST: GIANO CURIE Arte Collective, Booth 408 4 p.m. MEET THE ARTIST: KARIN ELLEN PINATO [Kun:st] International, Booth 155 NOTE: Programming schedule may be altered or changed. This is the most current information. All information is subject to change without notice or obligation. HOME: I’m a nomad. I move every few months between England, France, and Scottsdale, Arizona. In between, I travel. PROFESSION: I am an artist who writes about being an artist. I’m also the founder of The Working Artist Masterclass. HOBBIES: Teaching myself French and then throwing myself into situations where I make a fool of myself trying to speak French. Perhaps someday I will actually master the language. LAST BOOK READ: Harry Potter. Yes, I am the one person who had not yet read it. LATEST ACCOMPLISHMENT: After a lifetime being a dog person, I have recently become a cat person. WHY I DO WHAT I DO: I teach artists how to show and sell more work. I believe that by helping others to own their power of creation and thrive while doing it, I am making the world a more beautiful place. WHAT’S ON MY BUCKET LIST: Will I ever learn to speak French? FAVORITE PASTIME: Each day I grab a notebook and camera and go out for what I call my Artist Walk. It’s where I have my best conversations with The Muse. #artistwalks FAVORITE ARTIST: That’s such a tough question! But I’ll say Gregory Colbert of Ashes and Snow because not only am I in love with the imagery but also how the artist created a massive career outside of the traditional art world. Check him out. MOST RECENT ARTWORK ADDED TO MY COLLECTION: A beautiful drawing that Joseph Havel made for me. It makes me smile. JBIS CONT. together in a house in Austin, that we decided to create some art to hang on the bare walls. And the artful collaboration began. ABN: Tell us the evolution of your art from the past until today. What’s different today than what you imagined when you turned art into your career? JBIS CONT. show where we exhibited the POP Collection and marketed ourselves fully as the Bisaillon Brothers. We also now have an international following for the POP Collection, with many pieces being exhibited currently in the Netherlands and Great Britain. ABN: Why the POP Collection? What is the process? How did you come to discover the process and what draws you to it? JBIS: While working together on the Modern Visage Series, we began to envision a body of work that was more than a new series but an entire collection that incorporated all of the artistic strengths each could bring to the table. This new collection incorporates many mediums, technologies, and procedures. After more than a year of refinement, this process has evolved to combine acrylic painting on hard panel and canvas, mixed media, digital photography, and graphic design. At the same time the new collection was emerging, we realized that art in general was evolving past traditional norms and that exciting new digital technologies were going to define art of the future. Realizing digital art on its own is not as compelling as the organic nature of paint on canvas, a new process was needed and this idea fueled us in creating the multilayered, mixed media approach of the exciting new POP Collection. ABN: What are your plans and goals, both immediate and for the future? JBIS: Currently the POP Collection is our primary focus. With over 30 pieces in the collection produced to date, we have many ideas and plans to make it more unique and brilliant. And, of course, there will be new pieces ready for our 10th-anniversary show at Artexpo New York 2019 this April! For more information on the POP Collection, visit www. jeffreybisaillon.com or visit them at Booth 430. SPOTLIGHT PROGRAM Since its launch in 2016, the Spotlight Program has continued to be a highlight of Artexpo New York’s programming and events. This year’s recipients are each exceptional, bringing their cutting-edge talent to the forefront. Read on to learn more about the five amazing recipients who have been selected for this year’s Spotlight Program. The quirky and unique bronze sculptures of Anna Voloshko lift the heart and touch the soul. Ranging in style from steampunk to modern and grotesque to classic, all of Voloshko’s works are united in their expressive sense of personality and animation. There is a delightful nostalgic feeling to Voloshko’s pieces as if they capture the charm of bygone eras or stories frozen in time. In fact, one of Voloshko’s main goals in her work is to eschew what she sees as the impersonal, utilitarian, and technologically overrun modern world in favor of subjects that she believes will offer energy, peace, and comfort to her viewers. Voloshko says that no matter what, her work reflects her experiences, emotions, and relationships, as well as her philosophical view of the world. She wants her art to help viewers discover a moment where they can reconnect with themselves and God. Born in Ukraine, Voloshko currently works as a sculptor in Kiev. Voloshko was recognized as one of Top Artists of 2015 by Art Business News and her sculptures have been exhibited and can be found in private collections all around the world. Josy Britton decided she was an artist in kindergarten. In 1979, Britton graduated from Waterloo University with an honors Bachelor in Fine Art. Britton lives in an oak savannah forest adjacent to the Pinery Provincial Park with her husband, Gord. Their growing family enjoys being together, especially canoe-tripping in the wilderness. Britton is constantly inspired by miracles in nature and compelled to paint and share her eyes’ interpretation with others. Although nature is the inspiration for Britton’s work, sunlight is the primary subject of her paintings. Britton paints sunlight’s effects on color. Her watercolor paintings are created using an original technique of dividing the paper’s surface into jewels of transparent color that overlap to create more color fragmentation. Her watercolors on Yupo are painted in a subtractive technique Britton developed. Currently, Britton has been painting an encaustic series. When you understand Britton’s paintings, it will change the way you see when you walk a forest trail or travel a river. Her paintings have hung in over 95 juried shows and solo shows in regional and commercial galleries in Southwestern Ontario and across Canada. Anja Struck is living and working as an independent artist in Lueneburg, Germany. She is working out of her own art studio. Her medium is oil on canvas. The Hamburg native studied painting, earning a bachelor’s in art education, graphics, and design, and she completed additional studies with the renowned painter and sculptor Markus Lüpertz in 2010. Struck’s paintings are figurative and focus on people in the game of light, shadow, and movement. Life is on the move, flowing, and dynamic. To illustrate that, she blurs the contours. Struck has been working over 20 years as a freelance artist and has presented her works at numerous solo and group exhibitions in Germany, Austria, Poland, Turkey, and China. Suzanne Kolmeder, born in 1962, worked alongside her artistic work as a copywriter in an agency and was editor-in-chief of a publishing house before she finally became independent in Stuttgart in 2011 as a freelance artist. After experiments with different techniques and materials, she now works exclusively with acrylic paint on canvas, acrylic glass, and glass. Among other things, Kolmeder’s abstract images are created by applying countless layers of acrylic, and there is always a picture behind the picture before the actual vision of the picture takes shape. This technique and the partially reflective colors bring the works to life and relive them from different perspectives. Photographers Maddi Ring and Patricia Gilman, as members of a photography organization, had produced several gallery shows in New York City. They saw how exciting and motivating these exhibitions were to the photographers exhibited and wanted to expand those opportunities. In August 2012, they created the New York Center for Photographic Art (NYC4PA) with a mission to provide exhibition opportunities to fellow photographers worldwide. NYC4PA offers international themed open-call competitions juried by recognized experts in the field of photography. Prizes include cash awards, online gallery, catalog, and New York City gallery exhibits. NYC4PA is proud to advance the art of photography. In 2002, Patricia Gillman began to take photography seriously. It was that year that she acquired her first digital camera. Gillman explains further: “I had always used a good film camera for travel and family photos, but the digital camera changed the way in which I looked at photography, the way I composed a photograph. I really fell in love with the art and magic of photography through digital cameras. “But I wanted to do more with my images so I began to do alternative processes, she continues. “I started with Polaroid transfers, moved on to painting my photos, and now have produced note cards and coasters made from my photographs and original watercolor paintings. “I have spent a great deal of time creating infrared photographs. The panoramic photograph has become easier to do now that there are cameras that photograph panoramas. This is what I use. One gets the most amazing shots just moving the camera left to right or down to up.” Her work includes collections dedicated to the infrared, plus panoramic, flora and fauna, and the countries she has visited. A photographer with an eye for the architectural, Annette Schreiber creates works that make the most of the atmospheric potential in photography. Her photographs often observe high-rises, finding a surreal, sparse reality in familiar angles. Schreiber revels in negative space, letting the natural gradients of light in each urban landscape overtake her compositions. Even when the subjects of a photograph are rigid and linear, Schreiber transforms them into distorted, atmospheric objects that set their own patterns of wood, glass, and steel against the subtle swathes of sky. Much of Schreiber’s work is black and white, allowing the contrast between light and dark to be the focus. More than documentary, Schreiber’s works use a moody blend of grays, towering architecture, and silhouetted trees to convey emotion. Imbued with the photographer’s own feelings, each image communicates a tone beyond its subject matter. Born in Germany, Schreiber began photographing as a child. Since earning her master’s degree in photography in 2000, Schreiber has interpreted the world through her camera lens with a unique eye toward the sentiment behind the image. She recently won two categories and received an honorable mention in the 10th Pollux Awards. Artists: Aide Zorek, Ana Sanson, Cacau Fernandes, Cadu Assalin, Carlito Bicca, C. Rachel, Denise Kastro, Diva Giacometti, Flora Camina, Galileo Emendabili, Leila Bokel, Marcos Emendabili, Marcus Luconi, Maria Almeida de Menezes, Milena Juliano, Paulette Gerecht, Suzy Thaler Perondi and Sylvia Echeverria. MIMI BENRAZEK RA-7 Washington, D.C.
Video Sells Artwork CrumlicMedia has a full service creative team specializing in working with both artists and galleries to create innovative, effective videos. Do all you can to attract purchasers to your works! The people at CrumlicMedia are the leading experts to deliver beautifully produced media to connect you with your buyers. Arts and culture organizations boost local economies across our country. Whether it’s attending a music festival downtown, an evening at a theater or a different arts activity altogether, money spent on dinner, parking, dessert–even the babysitter–impacts the economic health of our communities. WE ALL KNOW SOMEONE DEALING WITH CANCER. HELP US CHANGE THAT. The American Cancer Society leads the way in breakthrough research and oï¬&#x20AC;ers free rides to treatments, free lodging near hospitals, and a 24/7 live helpline. Your tax-deductible donation helps fund all of these things and so much more. Please give what you can today at cancer.org.